What I found most helpful is the Appendix I NCA Climate Science - Addressing Commonly Asked Questions A-Z at the bottom of the above link page. Barron was one of only two workers from the BP drill floor to survive. He had been so excited to be working his first shift there. He struggles with the loss. "All the guys I loved were on that rig." He can't help but recall the ominous feeling they all had about this well since the first drill bit burrowed into the Earth. "This well did not want to be drilled," he says. "It just seemed like we were messing with Mother Nature." "The mountaintop removal mine may be the ultimate manifestation of modern industrial people’s ideology of conquest. 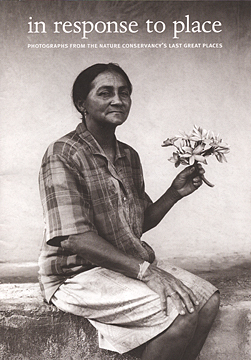 It symbolises a sociopathic culture, a culture so thoroughly divorced from its roots in wild Nature that it views the living Earth merely as a smorgasbord of ‘resources’ for exploitation and profit. Blowing up mountains and burying streams in pursuit of coal is a practice that could only be conceived by people who have forgotten – or reject – our species’ kinship with all of life. It is a form of violence against the land so rapacious that it literally condemns mountains to death. It ignores the fundamental need for health. It promotes sickness. It is utterly contemptuous of the future. 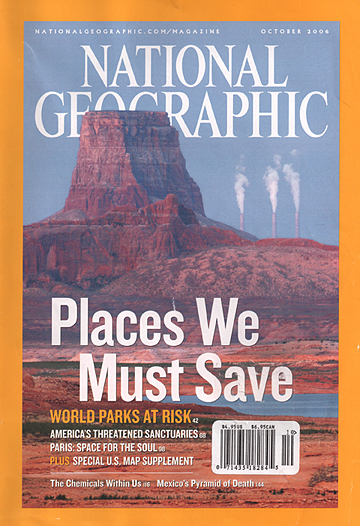 It is one generation of humans saying to other members of the land community, “You don’t matter,” and to our own descendants, “Screw you, I got mine.”"
"5 Places to see before Global Warming Messes Them Up"
"What the public doesn't get about climate change"
National Geographic Magazine, September 2006 Issue - The cover photograph shows one of our National Parks vistas with three steaming smoke stacks visible. “Come see our parks now, because their natural beauty isn’t going to be around much longer.” Another article: Trace chemical testing of one man’s blood shows 165 chemicals contaminates detected in his body. Is the natural beauty of our Planet Earth going to be reduced to just images on a wall in our museums and galleries, like our endangered animals are in our zoos? Write your congress representatives that environmental issue are very important to our basic survival in the long term. The sooner we start to make changes, the slower the destruction of our planet. Unplug re-chargers when not in use, or use surge protectors to turn off groups of electronics at night. Recycle ALL materials like plastics and cardboard along with all the paper, bottles, and cans. Take them to your local recycling center if you don’t have curbside pick-ups. Walk more, drive less. Use public transportation instead. Build Green. Buy EnergyStar appliances. Read packaging. Go Solar!